Native Pashtu speaker, Chief of Popolzai tribe. His karakul hat, a traditional headgear, is made from the fur of aborted lamb fetuses. 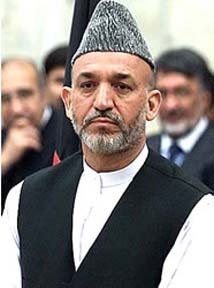 Chided by critics as the "President of Kabul", because the Taliban effectively controls much of the nation and Karzai's authority does not seem to seriously extend beyond the metropolitan area of the capital city.